*Bulldogs With Another Win In the Series: With tonight’s 27-10 victory over Auburn, the Bulldogs close out the SEC part of the regular season with a 7-1 league mark and improve to 9-1 overall. Georgia extends its series advantage over the Tigers to 59-56-8 in this the 123rdmeeting in the Deep South’s oldest rivalry. Georgia blanked Auburn in the second half, the third time the defense has done that this year (also Austin Peay & Middle Tennessee). Sophomore WLB Monty Rice led the team with eight tackles. The Tigers were limited to 274 yards of offense on 57 plays. *300+ On The Ground Again: The Bulldogs, who lead the SEC in rushing at 233.8 yards per game, finished with 303 on the ground today after getting a season-high 331 yards in the road win over UK last Saturday. Overall, Georgia churned out 516 yards of total offense, the most since 560 against Vanderbilt this year. Sophomore TB D’Andre Swift went over 100 yards for the third straight game to highlight the Bulldogs’ rushing game. Swift went for a career high 186 yards on 17 carries after going for 156 at #9 Kentucky last week. This is the most yards for a Bulldogs’ running back since Nick Chubb exploded for 222 versus North Carolina in the 2016 season opener. Swift also had a team-high four catches for 43 yards. Junior TB Elijah Holyfield also carried the ball 15 times for 93 yards. *Cashing In: Georgia had the ball for 20:02 in the first half and outgained Auburn 266 to 149 in total yards as the Bulldogs surged ahead 20-10. After starting with two field goals, Georgia had a pair of touchdown passes, including one in the second period’s final minute. On their second touchdown drive, the Bulldogs went for it on 4th-and-2 from the Auburn 38-yard line and sophomore QB Jake Fromm delivered a scoring strike to senior WR Terry Godwin. Georgia is now 3-for-5 on fourth downs this season. This five-play, 69-yard drive took 1:39. This is the Bulldogs’ fourth score at the end of a first half this year with less than two minutes to go. Versus Austin Peay, Georgia scored a touchdown in 1:10 on a four-play, 70-yard drive to end the half. Against South Carolina, the Bulldogs managed a field goal in 43 seconds on a five-play, 40-yard drive. Versus Florida, Georgia connected on a field goal at the end of a seven-play, 75-yard during a drive that took 50 seconds. Fromm finished the 13-for-20 for 193 yards and two touchdowns with one INT. The Bulldogs were 5-for-8 on third downs in the opening half and finished 8-for-14. He is now 21-3 as a starter and 8-3 against teams ranked in the top 25. Freshman QB Justin Fieldswas 2-for-2 for 20 yards passing. *Blankenship Puts Georgia On The Board: Junior PK Rodrigo Blankenship connected on a 25-yard field goal on Georgia’s opening drive to give the Bulldogs a 3-0 edge. Blankenship returned to hit a 20-yard chip shot at the 11:13 mark of the second period to cut Georgia’s deficit to 7-6. He is 17-of-19 on FGs this year. Blankenship also launched touchbacks on four kickoffs of the game to give him 58 on the year, which is ranked second nationally. 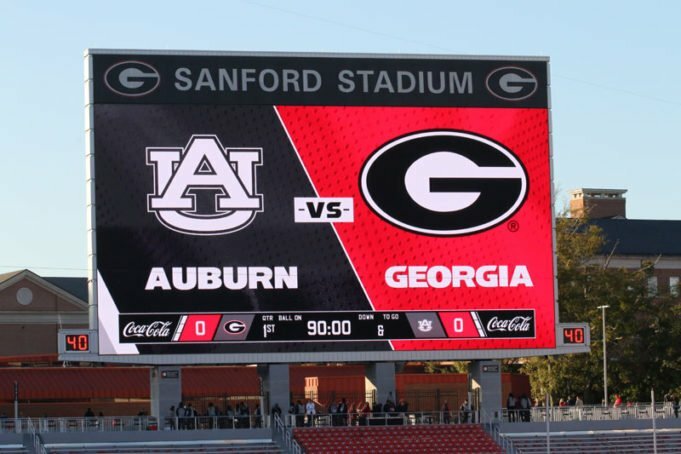 The first drive started at the Georgia 12-yard line and the Bulldogs advanced to the Auburn 2-yard line before the Bulldogs settled for a field goal. On the second drive, Georgia drove to the Tiger 1-yard line and then kicked four plays later. Late in the fourth quarter, the Bulldogs tried a fake field goal at the AU 14 and Blankenship overthrew Issac Nauta in the endzone. The drive did consume 8:44 as Georgia led 27-10 with 3:20. *Special Specialist: Junior Mecole Hardman took his first kickoff return of the game from the goal line a season long 41 yards in the second quarter. He came in averaging 25.7 each KOR this season. The Bulldogs capitalized on the return by scoring their first touchdown of the game. Fromm connected with junior WR Tyler Simmons for a 14-yard touchdown catch. This marked Simmons first scoring catch of his career. This put Georgia up 13-10 at the 2:47 mark in the second quarter. Freshman punter Jake Camarda had his first punt of the game on the Bulldogs’ opening drive of the third quarter. On his second punt, Camarda hit his second 38 yarder of the game. However, Hardman downed this one at the Auburn 1-yard line. Camarda only punted twice tonight. *Points Off Turnovers: Georgia is +4 in turnover margin. The Bulldogs have forced 14 turnovers that have led to 48 points and have 10 turnovers that have resulted in 16 points. Fromm threw his fifth interception of the year in the third quarter on the Auburn 19-yard line. The Tigers were forced to punt on the ensuring drive. *Starters: Freshman DB Otis Reese started his first game for the Bulldogs. After leaving the Kentucky game with a knee injury last week, senior C Lamont Gaillard returned to start his team-leading 38thconsecutive game. Redshirt sophomore OL Ben Cleveland returned on special teams after missing the last five games with a leg injury. *Next Up:The Bulldogs (9-1, 7-1 SEC) play host to Massachusetts (4-7) in the first matchup between the teams next Saturday at Sanford Stadium. The SEC Network will televise the game at 4 p.m.